AS India’s well-fed politicians bickered over a proposed Right to Food bill this week in New Delhi, workers in some of northeast Assam’s most remote tea gardens were literally starving on their feet. Family of a tea labourer in the Bhuvan valley tea garden live here. This is their home. In seven months last year, 34 people died of starvation or malnutrition-linked diseases on a single tea estate, Bhuvan Valley in southern Barak Valley, when owners temporarily shut operations and stopped paying workers for demanding better conditions and eight months of owed wages. “It was more like Death Valley than Bhuvan Valley. People were dying from one house to another,” says Prasenjit Biswas, who chairs the Barak Human Rights Protection Committee that brought the issue to the attention of authorities. Under pressure from the government and National Human Rights Commission, the owners restarted operations but the deaths have continued. From the roadside, Bhuvan Valley looks just like the gardens of Eden on the tea packets from which so many Australians brew their tea; flashes of colourful saris amid land lakes of topiaried green that seem to levitate above hillocks and plains. It is less picturesque up close. As tired, bony women file from the gardens at dusk, Mannu Ravidas, a casual tea labourer, waits for his wife. Like most of the workers here he was born on the estate, descended from the original tribal workers trafficked to Assam from central India during British rule. His ribs protrude from his body and his legs bow outwards in the tell-tale sign of rickets, a common affliction among workers. Ravidas, 50, says during last year’s closure his family “went hungry every day”, and his father eventually died. His wife is the only permanent tea labourer in the family. She receives 72 rupees ($1.20) a day, and weekly subsidised rations of 5kg of rice and 3kg of flour that looks like sawdust. To supplement her meagre income, Ravidas buys sacks of rice and resells them by the roadside. “So many people fell sick and died, including children,” says Champa, who heads the garden’s women’s panchayat (council). The same thing happened before last year’s deaths and workers here are again frantic with worry. With no manager to endorse their daily pickings, how will they be paid? Assam produces half a million tonnes of strong black tea annually, filling the tea bags of some of the most recognised tea brands sold in Australia, including Liptons, Twinings and Tetley. It represents half of India’s total tea production. Trying to understand the anachronistic slavery like labour system and working conditions of labourers in tea industry in Assam that drive them to starvation deaths. 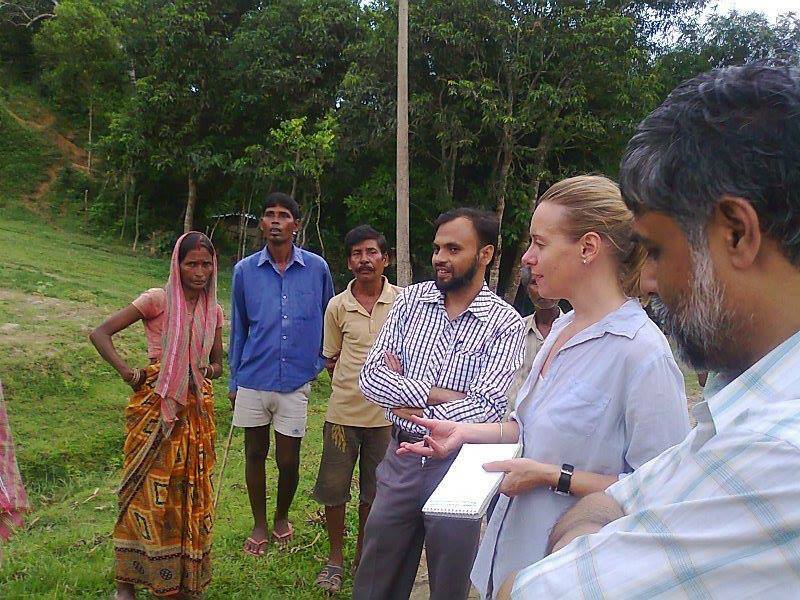 In Bhuvan valley tea estate on 19 August 2013 Waliullah Ahmed Laskar, Amanda Hodge and Dr Prasenjit Biswas. — at Bhuvan valley Tea Estate, Cachar, Assam. But declining productivity — and hence profits — in many Assamese tea gardens has had an alarming impact on the health and living standards of tea workers. Barak Valley has the lowest-paid tea workers in India, with a minimum wage of R72 a day — less than half the federally mandated minimum daily wage of R158.54 and at least R12 less than workers in neighbouring valleys. Estate owners say the rest of the wage is paid in kind, through the provision of housing, pensions, food rations and proper healthcare — services they are compelled to provide under the Tea Plantation Labourers’ Act. In reality, many estates fail to deliver even basic services such as clean water, and owe their workers millions in unpaid wages. Fair Trade Australia spokesman Nick Tabart says while consumers have successfully pressured the coffee and chocolate industries into improving wages and conditions, the tea industry lags way behind. Of 900-odd tea gardens in Assam, nine are Fair Trade certified. “We’re well aware that (Assam) is a region that requires attention,” he told The Weekend Australian. But the biggest barrier to securing living wages on tea estates is decades of low prices, underinvestment by tea estate owners and a “difficult legacy” of bonded labour. Nirmal Bin’s wife Basanti was 33 when she died on July 30 after a four-month illness. She was a permanent Bhuvan Valley tea worker and so entitled to medicines from the garden’s “dispensary” (just an outbuilding tacked on to an overgrown ruin) to treat her diagnosed kidney disease. “But they would only give us paracetamol,” he says. Many retirees on the estate have been forced back to work because owners refuse to pay out their pensions from the state’s Provident Fund — money deducted from wages that should have been accruing over decades. Tea garden owners are required to match that sum each week but the union admits proprietors of Bhuvan Valley and at least nine other local gardens have not done so. Kurmi admits many workers are exploited and that the union “failed” the starving labourers of Bhuvan Valley last year. It is still failing them. Behind the dispensary, Imti Rani Dushad is awaiting a pension payout following the death of her husband last year from tuberculosis, which he probably contracted from the canal water that workers relied on until a water treatment plant was finally built a few years ago. He died inside the dirt-floor hut in which she must now raise their five children alone. The long-closed dispensary reopened a week later. Now her greatest fear is that she too will fall ill. 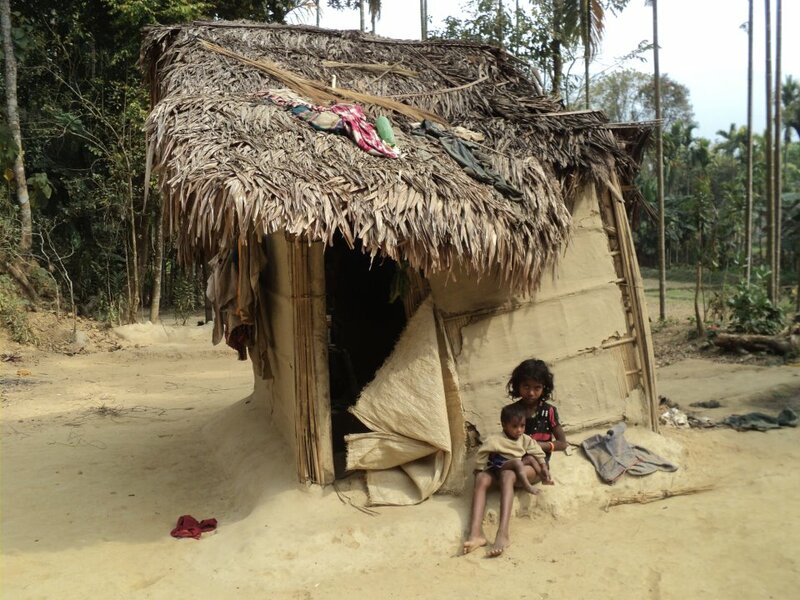 In another hut, Sri Charam Baruri nursed his dying mother last year. Her death was long and painful but he doesn’t know what killed her. His wife, the mother of four children, died a few months earlier, from another mystery cause that may have been meningitis. In the looming dark — there is no electricity — worker after worker comes forward to tell of their losses. India’s federal Tea Board says many of the 109 tea gardens of Barak Valley have been neglected by the tea owners, who lease the land from the state. “We’re focused on helping them improve methods and quality,” says R Kujur, the board’s assistant director in Silchar, though workers’ welfare is a “state government concern”. To rejuvenate declining tea estates the Tea Board is offering up to R80,000 per hectare to gardens willing to pull unproductive bushes and plant better performing varieties. Aware that publicity of shocking labour conditions — combined with a slide in tea quality — can hurt the industry, it has introduced a certification scheme and is pushing for proprietors to sign on. “It will take time to motivate the owners and labourer but I can assure you that within three years you will see a huge difference,” Kujur says. Bhuvan Valley is replanting 20ha of bushes but the Tea Board is still working to get gardens like Craig Park on board. The once grand estate’s tea bushes are producing 50 per cent less leaves than a decade ago. The district’s deputy commissioner described conditions at Craig Park as a “sorry state of affairs” and noted many workers had died while awaiting retirement payouts. Labourers fear the garden will eventually be closed. If that happens, thousands of workers will be forced off the land — with nothing to show for generations of cheap toil. This entry was posted on September 20, 2013 at 12:38 pm and is filed under Article, Hunger Alert, News, Starvation deaths. You can follow any responses to this entry through the RSS 2.0 feed. Both comments and pings are currently closed.